Recently, I realized that my knitting was becoming somewhat routinized. I’ve been knitting the same patterns (mainly socks) over and over. Don’t get me wrong. I love knitting socks, I love having socks I knit. But I’m getting a touch stale. There is a lack of challenge in socks. It’s not like…lace. I cast on my 56 stitches for 3 repeats of the pattern (18 stitch repeat with 2 stitches at the end). It’s not a particularly complext pattern, just 12 pattern rows (which you then repeat until the scarf is the desired length). I got through my first set of 12 rows, and realized that instead of the predicted 6 inches wide scarf, mine was closer to 12. Now, this isn’t a terrible problem, but it is wider than I wanted the scarf to be. So I ripped the whole thing out, and cast on 38 stitches (2 repeats of the 18 stitch pattern plus 2 stitches at the end). That’s when the trouble began. I got six rows in, and realized I had the wrong number of stitches. Out came the needle and I rip out the six rows.I cast on again. Four rows in, one of my repeats of 18 stitches is 20 stitches long. Pull out the needle, rip out the knitting. Cast on again. Two rows in, and my stitch count is wrong. Rip it out again. Tonight, after letting it lie fallow for about a week, I cast on again (after discovering I had to rip out, again). I’ve gotten through the first 12 rows, and so far so good. I’ve made an adjustment: I’ve added stitch markers every 9 stitches to keep track of my place in the pattern. It makes it easier to catch mistakes before I get too far. As I say, so far so good. This would be the point when I would normally insert a photo, but my camera batteries are currently charging, so while I could insert a photo from my walk to work this morning (of flowers, not of lace), I don’t think the picture would illustrate any of my points particularly. While a picture may be worth a thousand words, a thousand off topic words in a 600 word post seems like a bad idea. Never knit lace after any alcohol.Trust me, when you pick up again the next day, the stitch count won’t be right. Lace knitting is not for meetings; you have to concentrate too much (or at least I do) to be able to fully pay attention to the meeting. Put in lifelines frequently (a piece of yarn threaded through the stitches of a row which lets you safetly rip back to that point). OK…so far I’m failing this one. Be committed to the process not the finished product (be prepared to rip out a lot, and be okay with that). I’ll point out that these rules for knitting lace are all lovely, but I do much of my knitting during meetings. Often I knit when I’m too tired to do other work. Occasionally I like to knit while sipping a glass of wine. And I’ve never quite gotten good about putting in lifelines. Nut I’m quite skilled at ripping out my knitting. So I’ve finished my socks that I started in the wake of Diana’s death. I am quite pleased with them. They are colorful and fun. THey are comfortable, and wonderful. And to some degree, they will always remind me of Diana. Being done with them, I am filled with conflicting emotions. 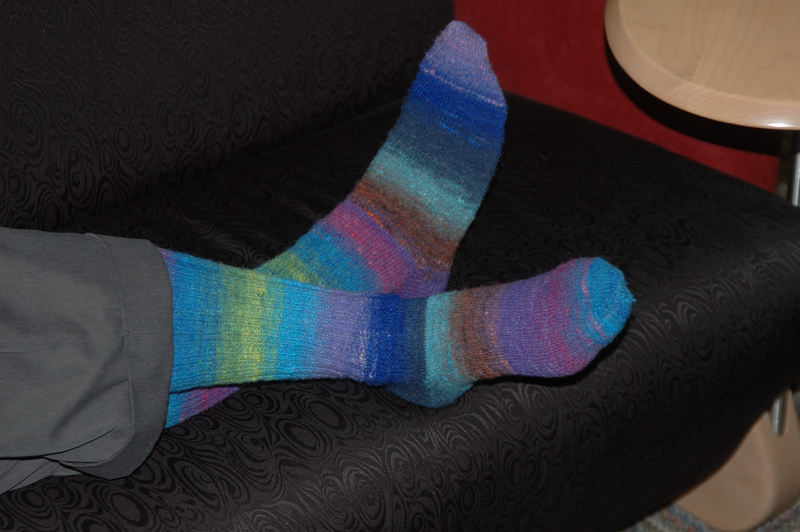 There is always the excitement of completion, and the sense that I am very much going to enjoy these socks. In this case, there is an added level. I had said that finishing these socks would, in some sense, mark the end of my mourning period for Diana. Now the question becomes, how ready am I to be done mourning? In most senses, I think I’m pretty ready. I’m not aware of her absence all the time, anymore, but there are moments when it sneaks up on me, unaware. Times when I think I catch a flash of movement out of the corner of my eye, and catch myself thinking I’ve seen her. Moments when I’m making sure there are no plastic bags lying around, and realize it doesn’t matter so much, because she isn’t here to chew on them. But for the most part, it’s getting easier. I’m very excited by these socks. They are warm and colorful and represent the kind of clothing I wish I could wear all the time. And therfore, I’m looking forward to wearing them often, enjoying the yarn and the colors, and thinking of Diana. It’s been way too long since I blogged. First, I wasn’t blogging because I had nothing to say besides, “I’m still missing Diana,” and I didn’t think that merited anyone else reading it. Then, I couldn’t quite figure out how to start again. Then I got pretty busy. So I haven’t been blogging. But now, I return. 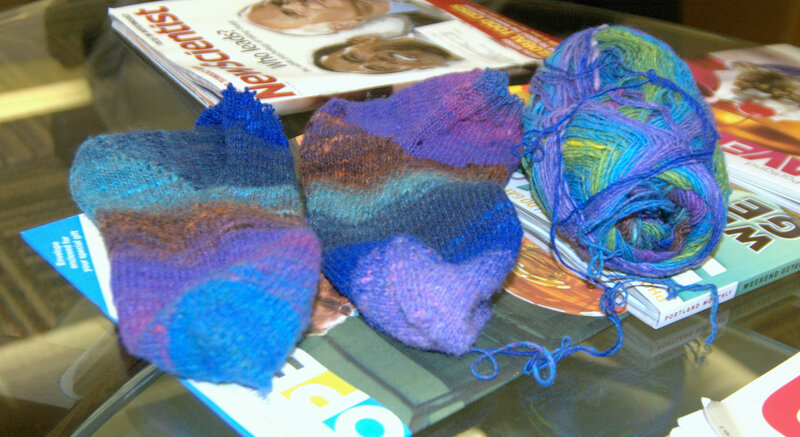 With a new knitting project: socks of Noro yarn, which I deliberately started while mourning Diana. It not’s that I didn’t have other knitting projects, but they were all for other people. And for the first week after Diana died, I didn’t feel like knitting at all (hard as that is to believe). After that, I wanted to begin to explore knitting again, but didn’t want my sadness and mourning being poured into a baby blanket I was working on, or a gift for anyone, in fact. I wanted to have those emotions become part of something I was knitting for me. 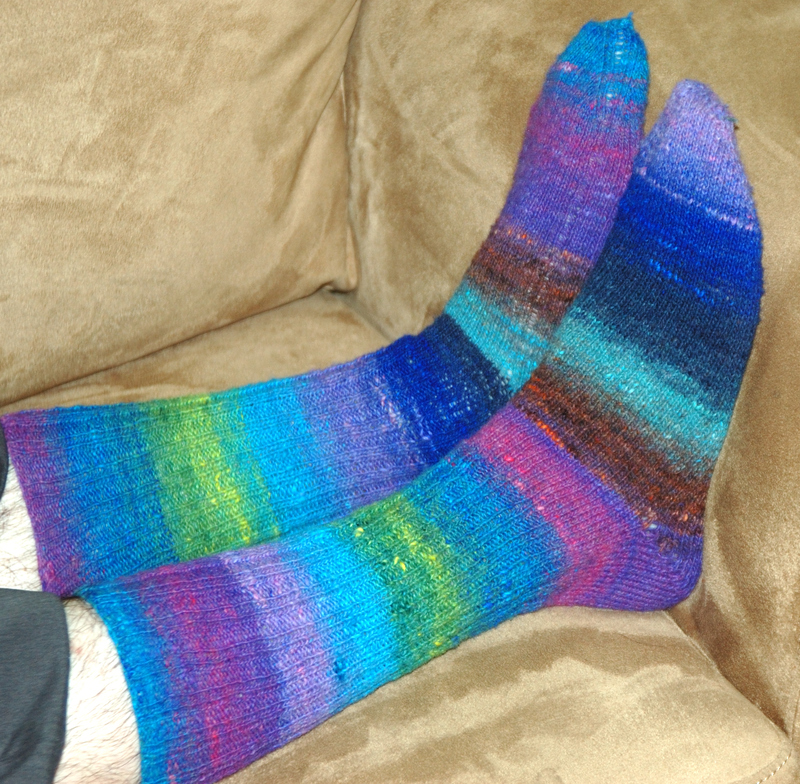 These socks are made of Noro Kureyon sock yarn which I bought with a gift certificate which was given to me as a thank you for doing a bat mitzvah. Noro is significantly more expensive than the sock yarns I’ll usually buy, but I’ve always admired the colors. It was a splurge, and it was for me. So when I was deciding to make something for myself, that I could put whatever emotions I was feeling into, this felt like the right thing to work on. At the beginning (and I’ve been working on these for 2 weeks or so, now), there was a huge amount of sadness involved. I would not have wanted to been working on a baby blanket at the time. Now, I’m still sad sometimes, but for the most part, I’m ok. In between I turned the heel, realized I’d made the foot too short, ripped back, and turned the heel again. I’ve been watching the colors slowly unfold from the skein, and enjoying the progress as they do. In Judaism, there are three stages of mourning. First, there is shiva, which lasts about a week. Then comes shloshim, which is 30 days. Finally, for the first year after the death, it is customary for the mourner to go to the synagogue daily to recite the kaddish, a prayer in memory of the deceased. Obviously, I wouldn’t observe these stages for a cat, even one I love as dearly as Diana, but I want some way to mark the end of the period of active mourning, and I think finishing the socks will be that way. So I’m knitting along on my socks, and looking forward to finishing them, and moving onto the next stage of life.